Although it may not sound like a great place to be, the mountainous landfill close to the Lake Erie shore in N.E. 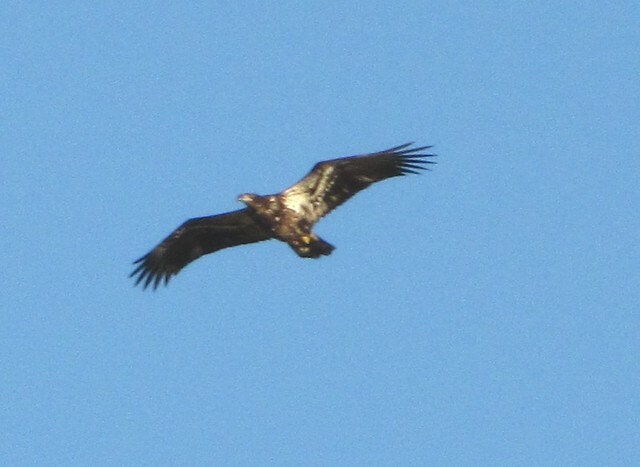 Monroe County (MI) is a spectacular place to watch winter raptors. The birds gather there to take advantage of the updrafts racing over the grassy slopes and to hunt the mice living on those grassy slopes. I feel fortunate that this place is along my route to the park, so I can eyeball it at sunrise and sunset. On one late afternoon pass – even considering the troublesome reality that I also had to keep my eye on the road at the time– I spotted a Kestrel, a Northern Harrier, a Rough-legged Hawk (I’ve shown you this bird in an earlier Naturespeak), and a Red-tailed Hawk. Last week two Bald Eagles caught my eye at this location. Bald Eagles always catch my eye, but these two birds were cavorting so actively that I was forced to pull over and watch them. I use the word “force” because they indeed exerted some mysterious energy which caused my hands to turn the steering wheel toward the road shoulder. These massive birds don’t normally engage in mousing like their smaller cousins, so it appeared that these two were simply enjoying the wind under their wings. Note that I said “appeared” because I would be the last to insert human emotions into the activities of a child of nature. But, these birds were not accomplishing anything except wind surfing. They were gliding up and down, over and back, and even sparring with each other (see above) like two kids on an ice pond. Now, I did intend to use the term “kids” here. Let me explain. 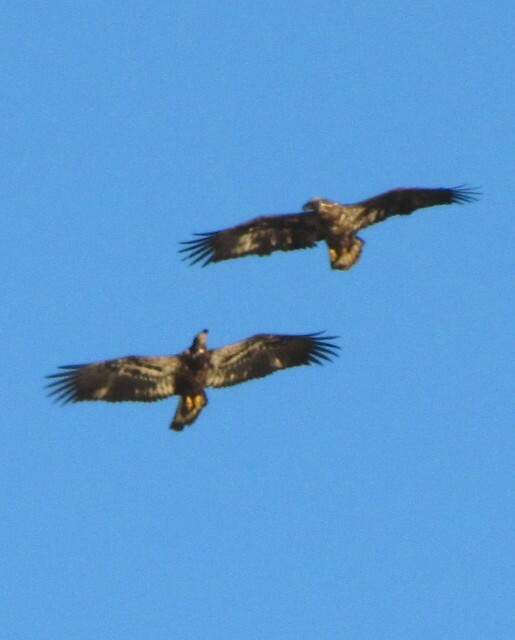 That these eagles were both “kid” birds was obvious by their dark appearance. Since bald eagles don’t get their bald – or white – heads until after their 4th year, they exhibit a variety of patterns as they mature over their first quadrant of years. One can usually tell how old a particular pre-adult bird is by visually checking off the field marks. Let me point out that my use of the word “immaturity” has nothing to do with behavior or size. 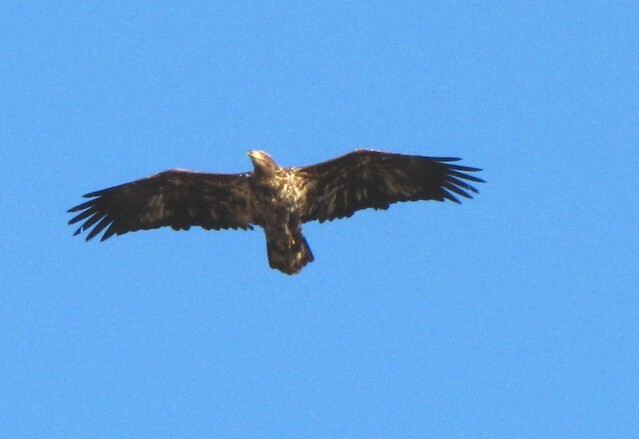 Immature eagles are full-sized as soon as they leave the nest and they rarely engage in hissy fits or tantrums. Let me also point out that I will stop using parentheses now that I have achieved this, the “meat”, of the blog. Oops, sorry about that. Although it is a non-scientific exercise, it has been calculated that eagle years are equivalent to about 2.5 human years. By that standard, the two birds I am discussing here were between 3 & 5 years of age. Since I don’t know of any 5 year human child that can fly, I’ll drop this line of discussion and re-direct it to the fact that one of the birds was in its 1st year and the other in it’s 2nd. In other words, even though they were “hangi.., darn it,… hanging out together they were not nest-mates. How do I know, you ask? O.K., here goes. The one year old bird (see above) is pretty dark overall. There is plenty of white sprinkling on his underwings and wing pits, but very little on his chest and belly. These portions are evenly brown. The belly is a lighter shade of brown than the chest, as a matter of fact. You’ll also note that his tail is whitish with a dark band at the edge and his bill is relatively dark. I wasn’t able to capture this angle, but you’d also see that there is was no white patch on the bird’s back. Most significantly, I want you to look at the trailing edge of the wing and note that the feather edging was even. Now, take a good look at the second bird. In the beginning photo, it’s the one at the upper right. Note that the edge of this bird’s wing appears ragged. This is a 2 year old bird. At least half of the secondary feathers are molting and replacing the baby feathers (I would have normally used parentheses there but a promise is a promise) which leads to that uneven appearance (see below and here). This single trait is enough to peg a 2 year old eagle anytime, but you should also look to see that there was quite a bit of white speckling on the belly, lighter feathering on the head, and dirt on the feet which indicates that it was able to walk. That last fact was untrue, by the way, but the rest was the honest truth. Now, just for kicks, take a look at this last shot (below) and see if you can tell which bird is which? I don’t think you’ll need me to provide the answer. (Especially if you were mature and paid attention). For all of us that have grown up with northern winters, there is no excuse. Spring always follows winter no matter how hard that winter was. We “know” this as fact but we don’t trust it. Unfortunately we cannot forget the year 1816. In that year Spring never actually arrived and the deadly summer that followed was the coldest on record. Crops failed and the grim reaper enjoyed global business. Perhaps because of this, we still harbor annual doubts that spring will arrive. 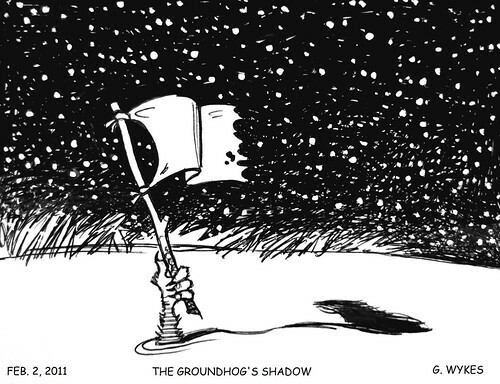 Right about now, as we are being hammered by multiple February storms, we are left to ponder if it will ever end. Perhaps history will repeat itself and we’ll be faced with a year when even teenagers can’t wear shorts. I am here to say that there is a light at the end of the tunnel and that it’s not a train. The steps towards Spring have already begun and unless they are de-railed …oops, poor choice of words…let’s say thwarted by the climate gods, then the seasonal progression is inevitable. I don’t have a crystal ball or possess any special powers (although I did make a balloon pop by looking at it once) – nature has bent my ear. 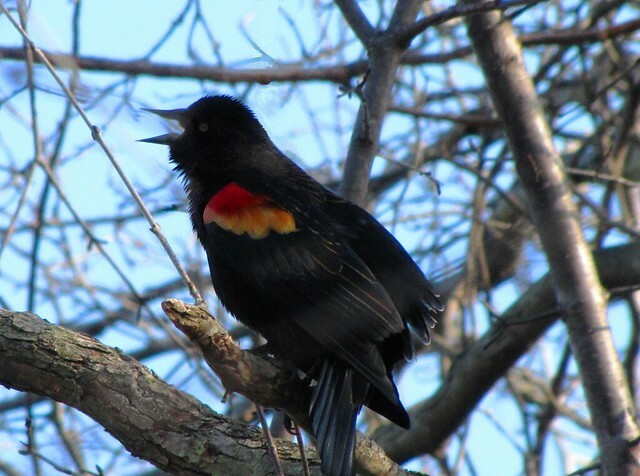 One week ago, the first Red-winged Blackbird of the season arrived from the sunny south. Unlike many robins and bluebirds which stay all winter, nearly all Red-wings migrate. So, when they show up around Valentine’s Day they are the first true migrants of Spring. The black and red males arrive about a month ahead of the females. Not needing to ask for directions, they arrive promptly and immediately begin to stake out their territories. I clicked my shot as a reaction to his surprising call, so my resulting photo was not the best Red-wing shot ever. But, I captured this clarion call of spring (see below). His was the first breath of Spring that will inevitably lead to many more as one season ends and the other begins. His single call went unanswered for the balance of the day due to the lack of any other males in the vicinity. But, the ice had been broken, you could say. I wonder if the Red-wings ever had a chance to do this in 1816? Yesterday, a small flock of newly arrived Red-wings were filling the air with their bubbling calls. While this will become mundane and common within a few short weeks, I reveled in it. Mixed in with the Red-wings, the winter robins were doing something that they hadn’t done for months. They were singing. I don’t mean their “chuck,chuck” call, I mean their warbling spring call. A cardinal, perched high on a Cottonwood, was belting out his “real-la-tee” call. A few days ago I heard the cackles of a few Sandhill Cranes around Brooklyn, Michigan and a Killdeer was heard somewhere off in the distance. Of course, all of this forecasting isn’t limited to the birds. You will recall that the Fox Squirrels have already concluded their round of early mating. The sap is now beginning to run in the Sugar and Red Maples. 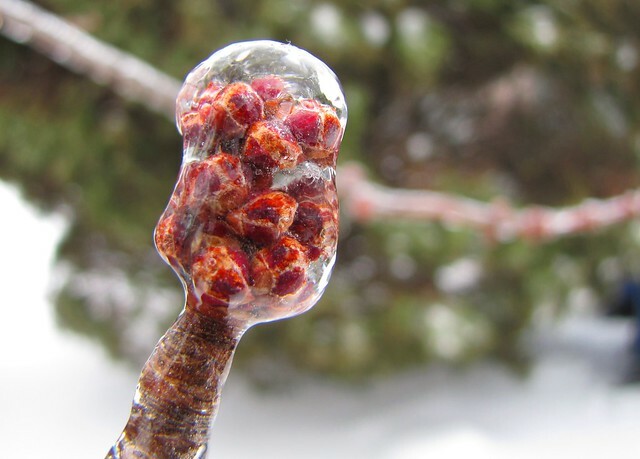 Their buds, even when coated in a layer of ice, are swelling ever so slightly. What do they know that we keep forgetting? Spring is not to be rushed. It will arrive in its own sweet time and not a moment sooner. All signs point to 2011 and not 1816 – at least for one more year. How Does the Turkey Trim His Beard? 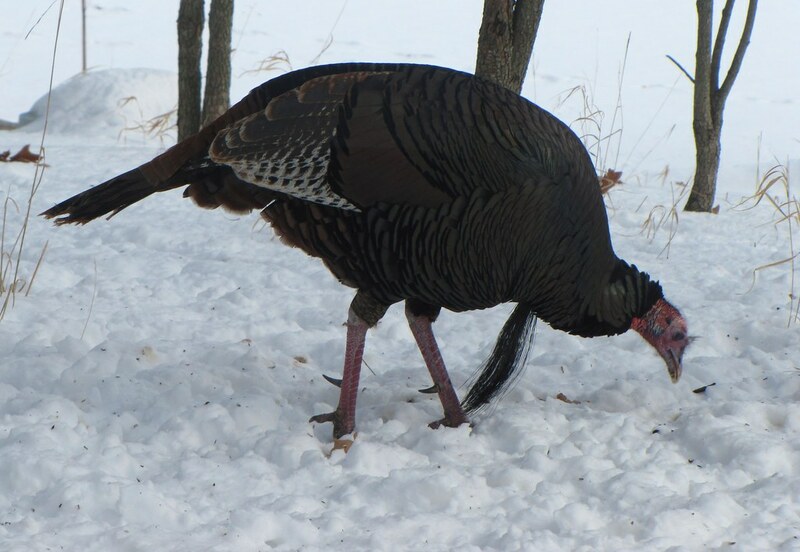 Until recently, I’ve only been able to view Wild Turkeys from afar – glimpses seen from country roads, mostly, of foraging flocks out in the middle of snow-covered corn fields. Like giant dark chickens their snaky forms can be seen scraping away the snow cover in order to reach the scattered grains below. They appear nearly black when placed against this white backdrop, with only hints of lighter wing feathers. Even at a great distance, however, the wary birds note my stopping and they invariably start to wander back toward the cover of the woods and out of binocular range. I was grateful, therefore, for the chance to recently do some close observation of some fine Jakes (male birds) at Kensington Nature Center. 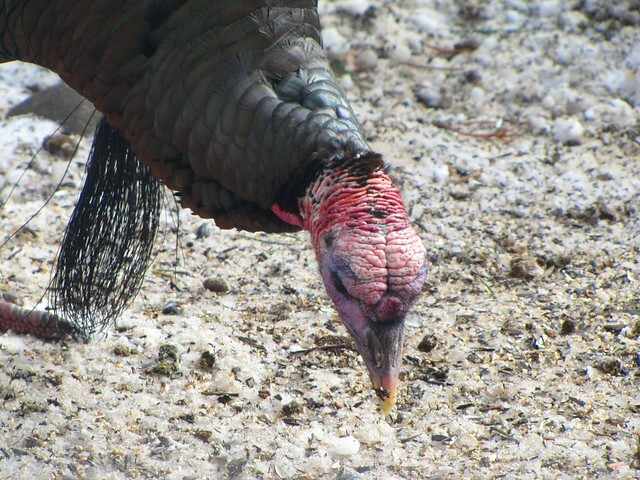 Close up, wild turkeys are very impressive. For those of you who have spent time watching these birds I certainly don’t have to tell you that. From their wrinkled blue & red skin heads to their iridescent body feathers, the North American Turkey certainly has the flashy looks. They transform into multicolored creatures when viewed in a bright winter sun. I was especially impressed with their wonderfully bronzed rump feathers for some reason. When the light hit them just right, these feathers seemed to glow like dull flames viewed through a sheet of isinglass. O.K., I was taking pictures of turkey butts … so what (see below). If this wasn’t bad enough, I found myself focusing (literally) on two other particular male traits – their spurs and long dangling chest beards. Only the males possess leg spurs. They use them during courtship battles just like barnyard roosters and pheasants. Starting off as mere buttons, spurs eventually grow sharp and slightly curved as the Jakes mature. As you can see, both of these birds have decent spurs, but frankly, I was more interested in the beards. Call it male envy, but if I could grow a chest beard I would do it in a minute, although I admit that multiple chest hairs would be nice for a start). Like spurs, only the males grow them (although a very small percentage of females will end up sporting small beards. There are also a few cases of bearded human females but none of them have chest beards as far as I know. Please… don’t let me know if this is not true). This ornament is a unique structure. It grows out of a papillae of spongy skin located at the midline where the base of the neck meets the breast. On rare occasions there are birds that have multiple chest beards sprouting from the same vicinity. Collectively, the multiple beards are small and never as impressive as a single large one. It’s hard to characterize just what turkey beards are made of. Because birds don’t produce hair, it is safe to say that they are not hair but, then again, they are not modified feathers either. 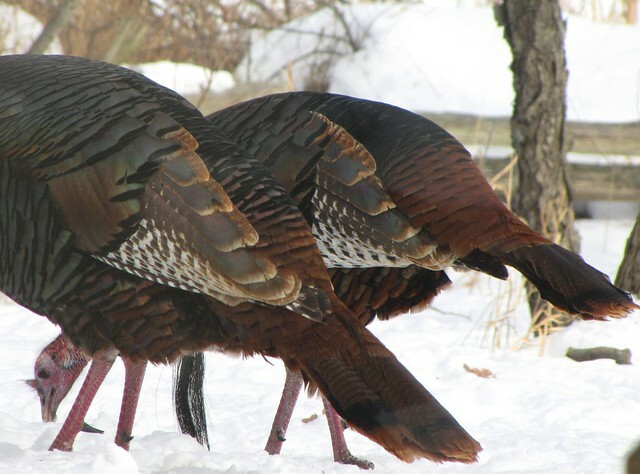 Feathers are molted on a regular basis and Jake turkeys do not molt their beards. Whatever they actually are, they look and feel just like stiff bristles from the tail of a small mammal such as a woodchuck. Perhaps there is some Native story out there that tells of the time when a woodchuck ran smack into a turkey and had to escape through the bird’s rear end –leaving the rest of it’s once long tail sticking out of the turkey’s chest (if not I’ll make one up when I have some free time). 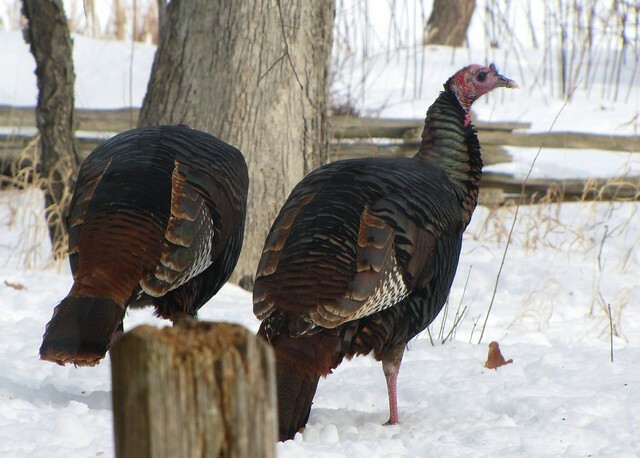 Because they grow throughout the life of the bird, some turkey beards have been recorded at well over a foot long, but most are significantly shorter. All are limited in length by the height of the bird and the elements. 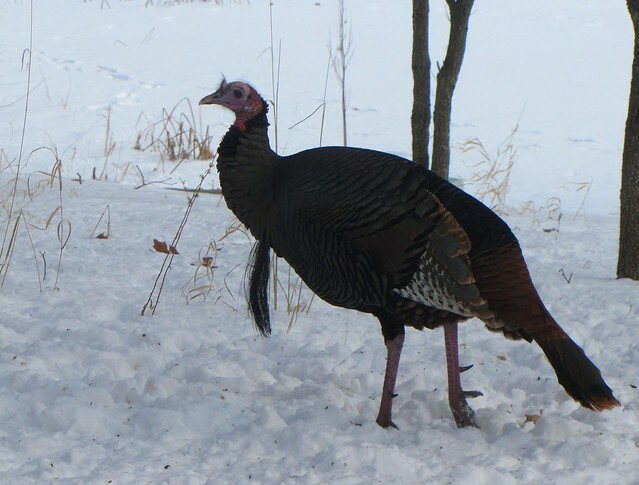 Young turkey beards are long and slender. They taper off into wispy tassels. Older birds have thicker structures that look as if they were trimmed into a brush-like ending. Why? Well, it has to do with feeding. Turkeys have to lean forward and bend down in order to feed. On older birds, the beard has reached a length where comes in contact with the ground whenever the bird is in this head-down position (see below & here). Successive ground contacts wear off the ends and makes for a neatly trimmed appearance. Other factors, such as snow and weathering can also break down the tassel tips as well. This is how the turkey Jake keeps his beard so nicely trimmed. So, there you have it, a semi-thorough discussion of turkey beards and spurs. We’ve spent so much time talking about this aspect that the birds have now run off. I was just going to wax poetic about the snood – that fleshy projection on the head. This will have to wait for another time, so please excuse me while I go off and flex my chest hair. Fish don’t often make the news, but when they do it usually involves lots of them – dying in droves and stinking up the place. Unfortunately, more often than not, this type of calamity is due to some form of accidental chemical or thermal discharge. In other words, it is usually our fault. 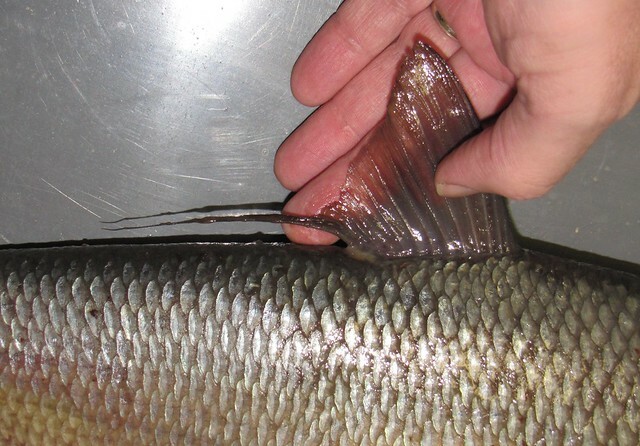 Recent reports of massive Gizzard Shad die-offs in the Detroit River and the shallow waters of western Lake Erie, however, have a totally different spin to them. The silvery fish are showing up and dying in biblical quantities. Earlier in the winter a massive influx of the fish clogged the intake gates at the Monroe Power plant and their mangled bodies mucked up the pumps. There were so many fish that their collective weight actually bent the iron bars supporting the grid. Were this one of the ancient plagues, the Pharaoh would definitely have considered releasing Moses’ people! Large windrows of the fish are showing up where the ice has retreated from the shore. But none of this is our fault – nor can we blame it on global warming, polar bears, or an angry God. We can pin most of the blame on the fish themselves. Gizzard Shads, you see, have the spineless constitution of gelatin on a hot August day, although it is the cold January days that do them in. They are native North American fish, but are nevertheless highly susceptible to cold and oxygen deprivation. Harsh winters (like the current one) create a solid ice cover which, in turn, leads to a lowering of the dissolved oxygen in the water. This in turn leads to lots of dead gizzard shad. This year, there are a few additional factors that make it an exceptionally bad shad (hey, that rhymes!) season. A few years ago, it was a good shad year (a super shad season) and lots of little shads were born. These little fellows are now coming of age and clogging up the river space. There is so much shad sushi out there that nearly every living creature, including traditional vegetarians such as Mute Swans, Canvasback Ducks, and Canada geese are eating them. Some of these birds are even fighting each other over the fish! Add to this a very cold winter and the apparent spread of a fish virus called VHS, and you have the makings of a great shad smackdown. Usually it is the smaller individuals that take the brunt of these natural evils. Most of the dead fish are less than 6 inches long. 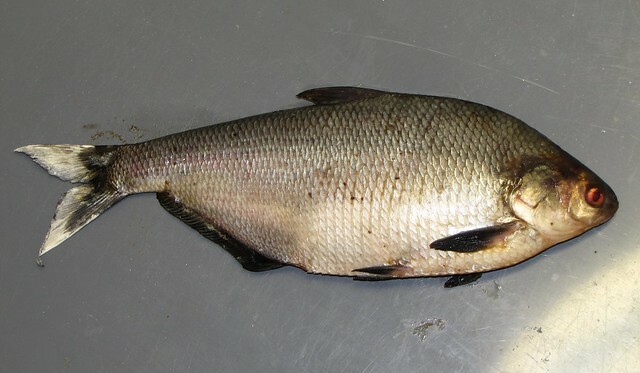 Gizzard Shad, however, can get quite large – attaining a length of 20 inches or more. Because they are such odd looking fish, and currently news-worthy, I thought this would be a great opportunity to show you one of the big ones that recently came into my possession. What one sees upon first gazing at a big dead Gizzard Shad is platter shaped silver fish with a big eye and small head (see above). What one smells I will leave to your imagination. The mouth is quite small for a fish of this size (this one was about 18 inches long) because they are filter feeders. They have no teeth per se. Instead, they simply take in microscopic plankton and filter it through a set of comb-like gill rakers. The “gizzard” part of their name comes from their muscled stomach which functions much like a bird gizzard to crush and grind the collected mass of micro-life. They are members of the herring family – a group which includes herrings, shads, sardines, menhaden, and anchovies – but are they are unique in possessing this gizzard-like stomach. 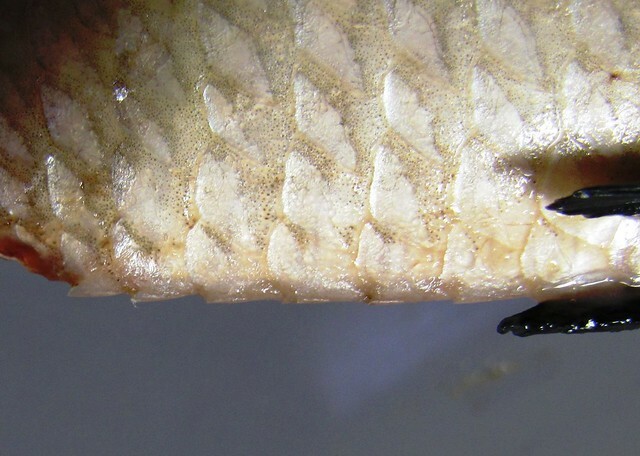 Like their cousins, however, they have a ridge of saw-like scales along the belly (see above) and they lack a lateral line -that row of vibration sensitive openings usually spanning the length of most fish. This is somewhat hard to see on the specimen, but easier to see (or, in this case, not to see) on my drawing of it (at beginning). Unlike their relations, they are not considered tasty by humankind (although I am not personally a fan of anchovies – nor they of me). 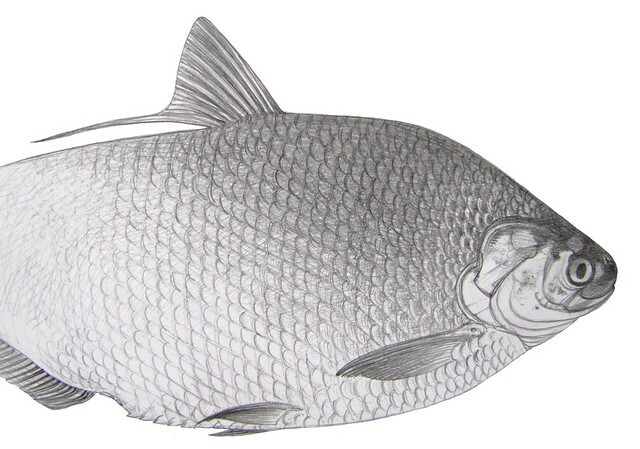 Externally, the Gizzard Shad has one more claim to fish design fame. The last ray on their dorsal, or top, fin is very long (see above). It extends several inches beyond the trailing edge. Why? Well, there doesn’t appear to be any “reason” other than looks. Even a glass-eyed shad needs some fashion flare in order to look good when their pictures start appearing in the morning news. When temperatures are hovering around the zero mark, the lives of hot blooded little birds become greatly simplified. Their daily routines become a series of black and white issues rather than a whole string of grey options. For them, the primary need is keeping warm. Finding liquid water and locating life sustaining food become secondary concerns – at least in the short term – when things become harsh. Over the course of my wanderings over the past few bone-chilling days I’ve noticed quite a few birds making the best of things (or, I guess you could say they were “birding up” to the elements). To greatly simplify my observations, let me say that a little warmth can go a long way. As far as birds go, they don’t ask for much. The colder the temperature the more likely it is that birds will engage in sunbathing. For them tanning has nothing to do with it. It’s all about microclimate. 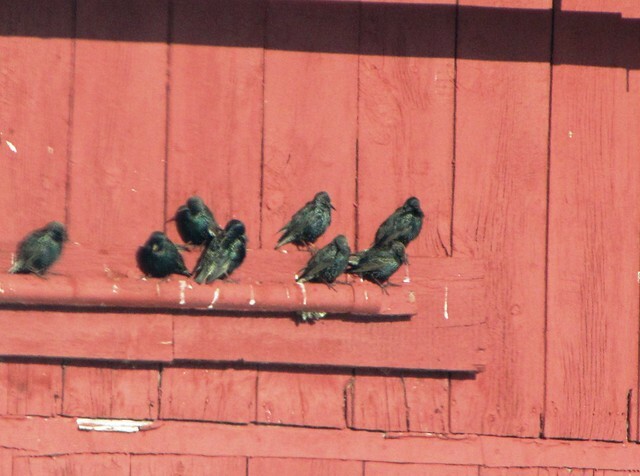 I noticed a cluster of Starlings clinging to the top rail of a barn door (see above). The flock selected the east facing side of the structure which was flooded by the full brunt (and warming influence) of the morning sun. Although there was precious little perching space, they clung wherever they could. Many were facing the sun with their heads pointed downward – presumably to warm the top of their little pates. In such a pose they looked to be humbly bowing to a great king, however. I suppose a giant ball of fire which influences earth from over 93 million miles away is worthy of such adoration. Heck, people have paid such homage for centuries! Further down the road a White-throated Sparrow was taking a different tact. Fluffed out into a nearly perfect ball of feathers, the bird was facing east and sitting on the ground at the edge of a patch of reed stems. His eyes were closed in apparent appreciation of the morning glow (see beginning photo and here). I hesitate to call it a state of bliss, but the little fellow certainly looked, let’s say, “satisfied.” My approach only elicited one open eye as if to say “please don’t bother me – not now.” I didn’t. Sunning is a tactic which works only when there is no wind. The good thing about bitter cold mornings is that they are often still and cloudless, so sun worship is usually an option. 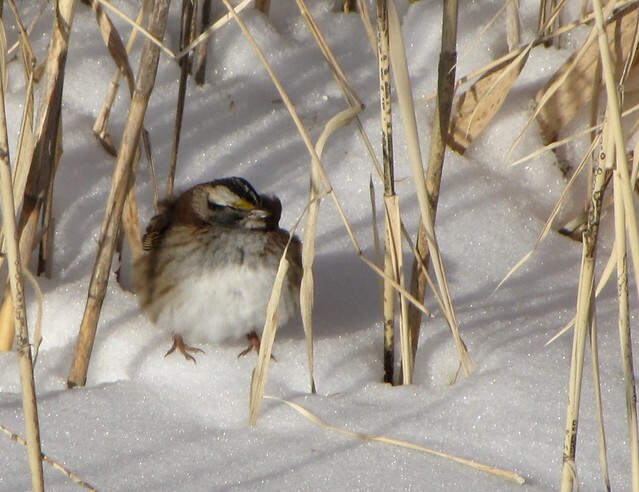 By puffing into a ball, our sparrow was maximizing his ability to trap heat and minimizing his conductive heat loss. If you were to ask him, he would say he was just trying to soak up more heat than he loses to the air. Actually, he would probably just say “Old Sam Peabody Peabody Peabody” and request that you get lost. Windy weather changes this dynamic because the sunbathers loose more heat to the effects of moving air than they take in. At such times it is better to slim down and hold one’s feathers tight. And, of course, get out of the wind. Starlings, perhaps because they come from a long association with European urban life, will employ another warming trick. As temperatures plunge, they will make more use of chimney heat. 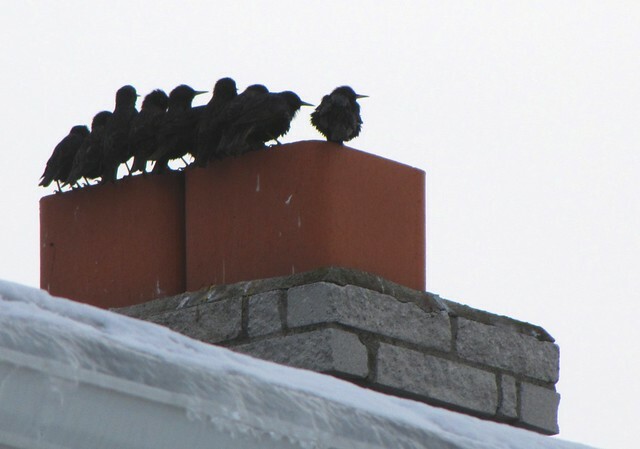 This behavior is not exclusive to Starlings but nine times out of ten, when you see a group of birds on a chimney they will be of the Sternus vulgaris ilk. They will cluster around the stack opening like so many bathers at a sauna – opening their lower body feathers to receive the warming draft directly where it counts. They do not appear to talk politics or of the weather (which would be an endlessly repeating mantra of “boy it’s cold, eh?). No they are usually silent when so engaged – deep into their few moments of summer within the winterscape. 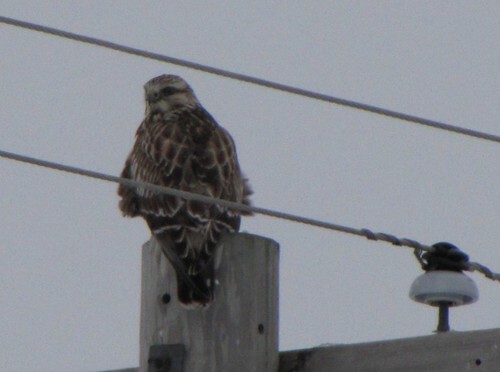 Up to this winter, I could count on one hand the number of Rough-legged Hawks I have seen. This is more from lack of trying than anything. They are uncommon, but regular, winter residents in our neck of the woods and if I were the on-line birder/posting type I could follow the internet highway and direct myself to dozens of local sightings every year. Since I am not an e-birder or a lister, I prefer to find them on my own – which means I don’t see them very often. I do listen to other folks, however, and will keep an ear open for verbal reports. Of course, I realize that many of these “word of mouth” sighting reports originate from net postings, so I guess I am a blatant, although honest, hypocrite. This self imposed rareness factor creates a joy of discovery when I do spot one before anyone tells me about it! Call it the simple pleasure of a Capuchin monkey finding a peanut next to a jar full of them. This is one of those years when my self-hypocritical Luddite restrictiveness paid off. I have required the use of both hands and even a few toes in order to track my independent Rough-legged sightings. It has been a banner winter for the birds and I (and many others) have spotted them across southern Michigan. 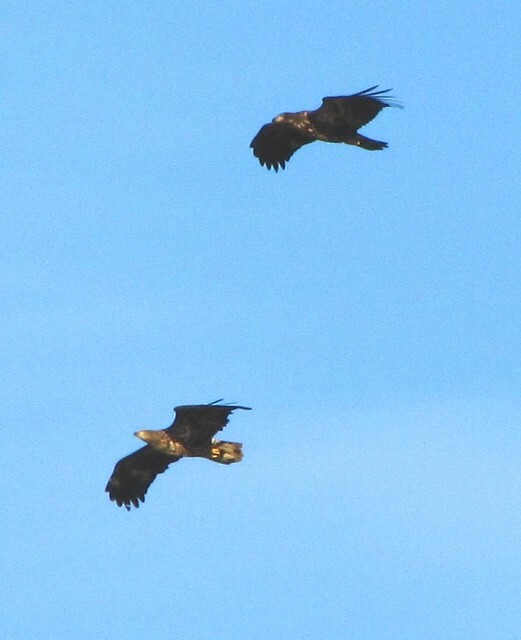 In fact, a pair of these birds hanging about the Pointe Mouillee Game area have nearly become an obsession for me. I have seen them often enough, but the obsession arose from the obstructed desire to get a few decent pictures of them. It seemed that every time one or two were in sight, it was either in the middle of a snowstorm, when I was driving and a Mac truck was pushing up my rear, or the creature was a mile off. This morning the glaring sun was behind one of the birds which happened to be a mile off as multiple trucks crowded me. My photos certainly reflect all these situations but my quest is still on-going. Why the excitement, you ask? 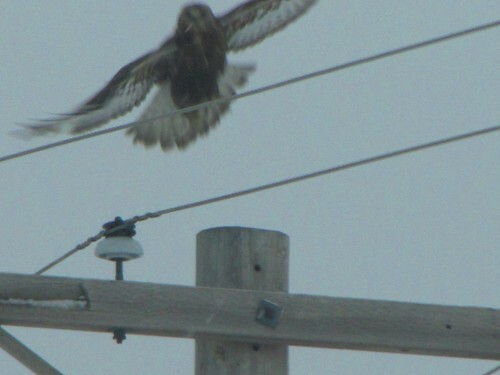 Well for starters, Rough-legged Hawks are Arctic visitors. Just like Snowy Owls, they winter down in the lower latitudes and return north to nest. Their summer breeding range is in the high tundra zone which stretches around the entire top of the world from Alaska and Canada to Europe and Siberia. Our Michigan birds do not come from Russia, mind you -they are from the Canadian Northeast – but the species is distributed worldwide. They are called Rough-legged Hawks on this side of the pond but are equally well known as Rough-legged Buzzards or Zimnyaks depending where “here” is (I suppose you can tell which one is the Russian word). Scientifically they are called Buteo lagopus which means “rabbit-footed hawk.” They do not take rabbits, but they have fully feathered legs extending right up to the toes which give their legs a distinctive rabbit-foot appearance. Only Golden Eagles and Ferruginous Hawks share this trait. Although their long pointed wings span a wider space than those of the locally common Red-tailed Hawk, their feet are actually smaller and are equipped only to handle small rodents. 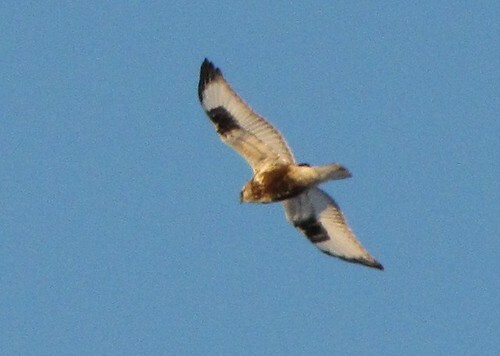 As a group, Rough-legged Hawks vary tremendously in pattern. All have a dark belly band, white tail with darker terminal band(s), light flight feathers, and dark wrist (carpel) patches on the wings, but these traits are often obscured by other factors. The two Pointe Mouillee birds represent two different color morphs, for instance. Unfortunately, there are probably a dozen different recognized color variations so I’ll just call them a light morph and a dark morph and won’t insult you by explaining that the dark morph is the…well…the…darker one (really). The lighter phase bird (see above in this glide-over shot) exhibits classic coloration in all regards. Often, the bird guides will explain how approachable these birds are. Being from un-inhabited regions they are “quite trusting and docile around humans” they say. My Mouillee hawks are proof that birds do not read, for they have proven skittish in the first degree. While cruising past their hangout last week, I noted that both birds were perched atop two consecutive telephone poles close to the road. It was in the middle of a mini-blizzard, but I turned around and approached them at a respectful crawl. I was only able to snap off a few shots of the lighter bird (see below) before it took off into the flurry. The darker one lifted immediately as soon as I stopped (see ghostly portrait at beginning). I am especially enamored of the mysterious dark bird because it is so unusual. It is chocolate brown from head to toe, front and back, with only the white inner tail and primaries to show variety (see here in this long range portrait). I will not give up my attempt to get a slightly better shot of this individual. My time is running out as Spring slowly approaches and it vacates the banana belt for its return trip to the howling north. Although the true scientific name of the Great-horned Owl is Bubo virginianus, I propose Hootus frigidus as the unscientific name for this species. Perhaps, by doing so, I am creating a whole new naming system that just may catch the naturalist world on fire. For every Latin/Greek scientific name there should be a totally unscientific pseudo-Latin one to balance it out. Sylvilagus floridanus, the cottontail rabbit’s name, would become Herecomus petercottontailus and Ondatra zibethicus, the muskrat, would be Monroeus we-eatus. Now that I write this, however, I realize that this idea has already been forwarded by the Warner Brothers. Need I mention Wiley Coyote and the Roadrunner series? Are there any new ideas out there anymore? 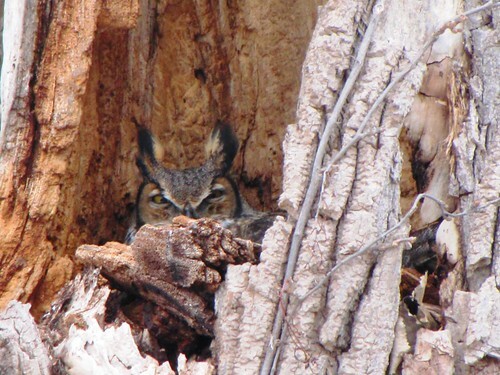 Well, never mind, let’s just forge on with my original statement regarding the Great-horned Owl. This bird not only deserves my newly proposed unscientific name but a new common one as well. It is more of a Snowy Owl than the Snowy Owl itself. How about Great Snowy Owl? The reason for the above waste of type space is to again highlight (for I do it every few years) one of the most remarkable feats of the avian world. Great-horns nest in the middle of winter. They don’t wait until the sting of the season is past, no, they lay their fragile orbs of life (by this I mean eggs, of course) in the dead of winter. I would be the first to say that the term “dead of winter” is a well earned term. Things die in the winter. It’s is a time of survival and hanging by the cracking dry skin of one’s frozen teeth. 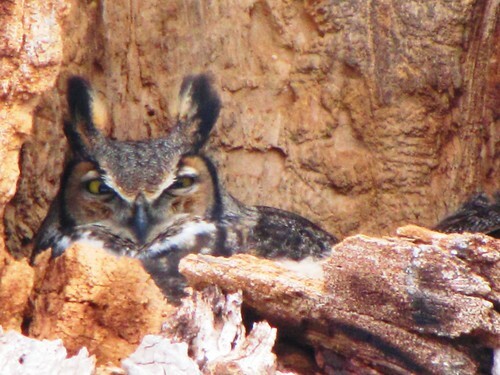 Perhaps because they have no teeth to hang on by the skin of, both of our local owl pairs are now well into nesting. One of them is in a familiar spot. A few blogs back I showed you an image of a male Great-horned perched complacently on a branch (Iwanta be-aloneia). I theorized that his mate, and her nest, would be close by. Since that time the nest, and the female in question, have been located. 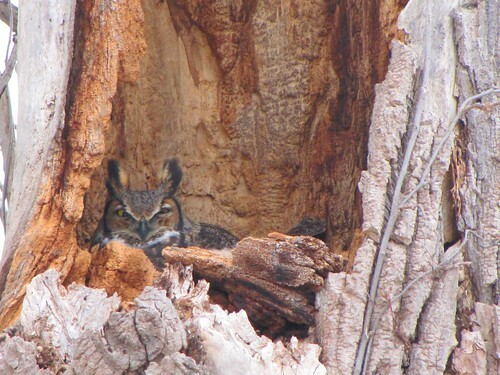 Her chosen spot is a large cavity within the broken stub of a huge decrepit Cottonwood. This is the same place that the couple chose two winters ago (we don’t know where they nested last year). Although Great-horns don’t normally nest in the same place more than once, they will if no new alternatives present themselves. Mrs. G.H. Owl was on the nest, and presumably on her eggs, by the last week of January. A quick check of the weather history from Jan. 28- Feb. 3 reveals that the average temperature over that time span was about 17 degrees F! The thermometer never rose above freezing and it frequently dipped into the single digits. Add the “storm of the decade” into this mix and you have one of those winters in which the word “dead” has true meaning. She has stuck to her task so far – enduring bitter winds and blankets of snow. If this owl followed the usual plan, she will have laid 2 or 3 round white eggs. They were laid a few days apart but she would have initiated incubation as soon as the first was laid. It is believed that most, if not all, of the incubation is performed by the female. Males don’t have brood pouches, those featherless belly spots used to warm the eggs, so there is little he can do in this regard. They may occasionally switch places, but his role is to gather food (capturing Snackus with-earus : aka rabbits). Now you can see why I call them Great Snowy Owls. Even the real Snowy Owls don’t dare to nest in the heart of winter. You’ve got to look at Emperor Penguins to find a more extreme example of winter nesting. If all goes right, and it does 80% of the time, the first owlet will hatch out in the “tropical climate” of February and the rest will follow in the “steamy days” of early March. Then, you might say that is when the real work begins. But I wouldn’t say such a thing directly into her face if you know what’s good for you.